Product code: ES3194 Categories: Sold Items, Sold Jewellery. A piece of antique jewellery is always so special and has that “something” about it and here is a stunning antique ruby and diamond bracelet that was made in France in the early 20th Century. Made in 18ct yellow gold and platinum, the design of the gold work alone is delightful with the lovely elongated links. From end to end the bracelet measures 18.5cm in length and is so easy to wear all the time day or night. However typical of many antique French bracelets, it is the addition of both natural rubies and diamonds that adds so much charm and character to an already very elegant antique bracelet. 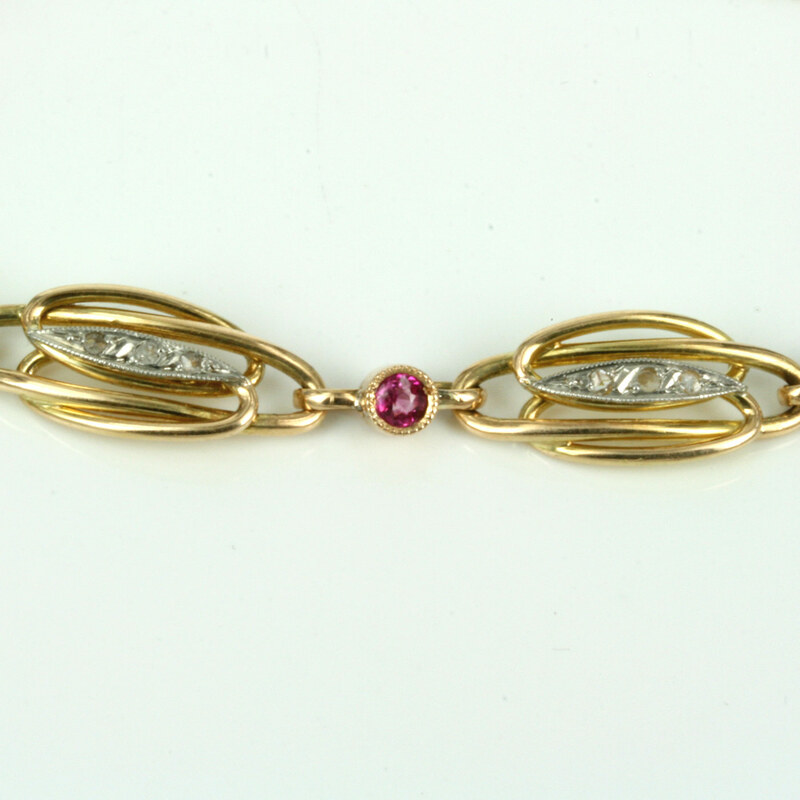 The bracelet is set with 4 rubies and 3 round European cut diamonds in between the main links and these rubies are migrain set which can be seen as the elegant crimping around the edge of the setting which was a typical style of the Art Deco era. Then each of the 7 links is delightfully set with 3 rose cut diamonds. 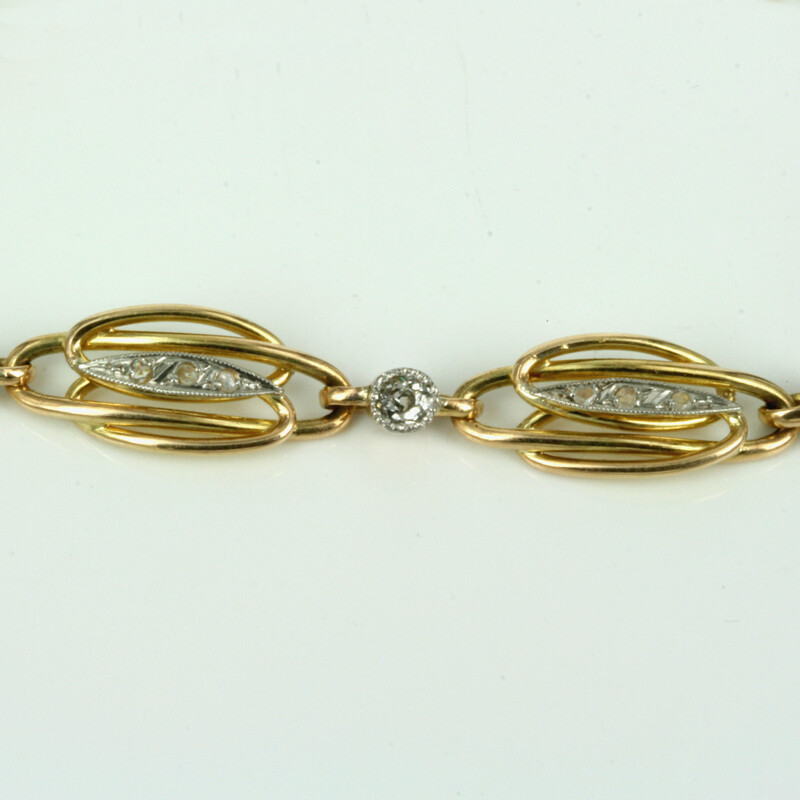 These diamonds make this antique bracelet look so elegant and that that extra something to it making it all the more delightful and full of character. In total the rubies total 0.40 carats in weight and the 24 diamonds totals 0.45 carats, and the fancy oval links measures 8.8mm wide at the centre of each one. This is a stunning example of a very fine quality antique ruby and diamond bracelet that looks amazing on the wrist and will always be admired and appreciated.